It all started when my friend Abe (you’ll see him in my blogroll) asked a question I had asked myself so many times before. I don’t think he’ll mind my sharing it here, as I’m sure many of you have asked the same thing too. Which is: is there a way to email a blog that you read to someone’s email account? I started to reply to him and then thought “hey maybe I should take a good look” and so that’s what I did. I went to wordpress.com’s personal dashboard, which is basically a menu system that allows you to customize the crap out of your blog. Everything from general appearance to widgets (that’s those things you see along the side of this blog, like stats, and twitter comments and the like), to how many nested comments are allowed. (I set mine at the max, by the way, which is ten. Apparently that’s still not nearly enough). And then I discovered a menu item called “domains”. I’m an IT guy, so I know damned well there would be nothing in there having to do with emailing blogs elsewhere. Still, my ears were up and so I went sniffing around. “Interesting!” I thought. This was clearly an item that, when accessed, would allow you to provide your own domain for your blogs. I didn’t have a domain though. So…I went to godaddy.com. Bear in mind: I still hadn’t replied back to Abe’s email yet. Nope. wolfshades.com was available. For only $7.99 or something. Such a deal. I thought I should go for it. So I decided to buy the domain. The sign up area wanted an email address, and not one of those throw-away free ones either. The website indicated that a godaddy.com email address would work. “How do I get one of those?” I wondered. “Maybe I should click on ‘new account’ and I’ll get one that way.” The website wasn’t clear. I set up my new account, but it was still wanted an email address, so I gave it the one I’m using. But wait. Where’s the godaddy.com email? So I spent another fifteen minutes looking around for that option, clicking on various links. And then finally I found it. And yes, it costs money. So…I went back and purchased my wolfshades.com domain. And I also bought the Canadian version – wolfshades.ca – just to keep it safe and out of other people’s hands. “In fact, I don’t even need one email account.” And with that, I clicked on “remove”. “Do you want to protect your domain?” From what? Raiding invaders? Gingivitis? I read a bit further. Apparently there are people who will park themselves, just waiting for your account to lapse just so that they can scoop the domain. Yup. Need to protect myself. So I clicked on “buy”. “What about privacy? Do you want your real name, address and email blasted across the internet, whenever someone does a WHOIS on wolfshades.com?” (Not in those words of course.) Absolutely not. I’ve got stalkers out there (long story, and another blog). I figured I’d better buy my privacy too. “We’re assuming you want two years on this account right?” I looked at the bottom line. We were into about $120.00 by now, so I changed that to one year. “Do you want people to know your website is safe?” Kind of like “stampsies” I suppose, where you slam your foot to the ground and say “HOMEFREE!” Yes, I suppose I want people ot know my site is safe. Buy. Are we freaking done yet? I made my chose and, just before I click on “buy” I noticed that there was a little field called “coupon code”. SCORE! That must mean I can get this a bit cheaper. So I googled “coupon code for godaddy”. Found a site immediately, and plugged in a coupon code. The page refreshed. The cost hadn’t gone down. Damn. I went back to the coupon page and chose another one and plugged that one in. The page refreshed, and there it was. $10.00 cheaper. So. Are we done NOW? Not quite, as it turned out. It took a bunch of verification mechanisms, including one phone call to my cell phone, before godaddy confirmed my purchase of the two domains. Time to plug that sucker into WordPress. I tried. I clicked on Domains and then entered wolfshades.com. I had. But I did it again, because as everyone knows it takes a least two tries at doing the same exact thing before it works. Right? Wrong. It didn’t work. WordPress suggested that I needed to add their name servers (it’s a long story. If you’re in IT you’ll understand but if you’re not, don’t worry your pretty little head about it, ‘k?). Anyway, I went back to godaddy.com and entered wordpress’ name servers. Then I went back to WordPress and tried it again. It worked. But we weren’t quite done. WordPress wanted its slice of the pie too. “That’s gonna cost ya, buddy.” It sure did. $7.99 per annum. I paid, and now finally, it worked. But wait. What was I trying to do in the first place? Oh right. Figure out if it’s possible to email a blog to someone. I spent another five minutes looking around and googling. And so finally, two and half hours after Abe sent me the message, I finally replied back to him. Sorry, Abe. I just lost focus again. I would tell you that it won’t happen again but …. I’d be lying. Who knew a simple email would cost me $62.00? LOL, any chance Abe has stock in GoDaddy.com? Wouldn’t surprise me, Holly. :) Maybe I need to buy some stock too. $62.00? Well, you got your domain. I sent you an individual e-mail message with a link to a blog post. Hope you get it. Didn’t cost much, but that’s another story. I actually didn’t get it, Michael. :( Don’t know what happened. I mentioned this already on my blog when I couldn’t get to this one but, here it is again. If you you use Firefox and then you could use this add-on. Thanks! I got it and installed it. Thanks very much! Oh yeah, that was quite the sidetracking you got on there, lol. $62 to answer a question about emailing posts, eh. Remind me not to answer any questions on my blog. Heh. Well the new domain is working now, but I’m going to leave it for a day before making the change here. Just to make it has a good chance to propogate everywhere. Yeah. Sorry about the question. And the $62. That was funny stuff!!! I’m glad to see it working again, but…where did wolfshades.com go? I mean for $62, I am expecting to see something pretty darn cool! I used Godaddy last year to set up a website for my business…I used a credit card that expired right before Godaddy tried to charge me for another year. Bummer. I guess in a roundabout (or boot) way, I owe you…what, like $50 Canadian or something? Yeah. Check’s in the mail, buddy. 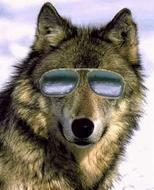 I’ll re-instate wolfshades.com probably at the end of the day. It’s working now of course (just plug in wolfshades.com and it should direct you back to here), but I want to make sure it propogates fully before making the change. Should I be happy now that I’m a simple woman without much to say? You IT guys go out there. I’ll read. Not post. Just read. Yes, this was pretty loaded with a lot of IT stuff wasn’t it? Cool. I see that wolfshades.com is up and running! Nice. I’m sure it was worth it, too. heh heh. Yes. This was a case of being too eager out of the gate. *sigh* I’m an IT guy – I should have known better.